Nuthatch at my Feeder – Let's Paint Nature! Oh BOY! Look who came for a visit at my feeder today!!! It’s the white-breasted nuthatch! My friend now, I guess. So why the heck am I so excited about a year round bird in my state of Illinois? Because he never visits me! Today he did. No lie, I never see this guy at my feeder. Sure, I see him all the time at The Little Red Schoolhouse or in the forest preserves, but never at my house. I have two feeders in the front yard. One is an upside down suet feeder that only the woodpeckers and nuthatches can feed on (oh, and the occasional bad squirrel that hangs from the hook and turns it over), and a regular seed feeder. Today my nuthatch friend had supper from both feeders. He hung upside down to feast on suet and then he grabbed a seed (probably sunflower) and flew away to a near by tree to hatch it! Oh yeah! He likes me now! ← Let’s Paint Autumn Berries! 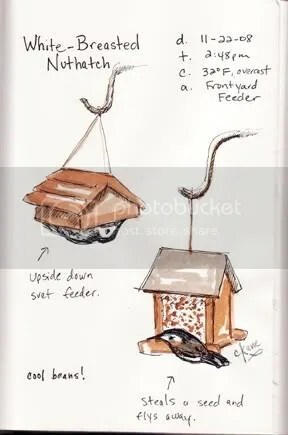 Love the sketch of the feeder and bird! A real artist! I love surprises with the visiting birds! Sweet drawings of the nuthatch Chris! They are such nice little birds. We’ve had one at our feeders, too. A red-breasted nuthatch. But I haven’t been able to get a picture yet. As far as I can tell, there’s only the one – I don’t know where the others are. Great sketch of a fun and active bird! I looove the suet feeder idea, Chris. What a lovely image and post.!!! WOOT that the nuthatch visited you!!! We had one at the feeder today too. Lana: Oh I hope your nuthatch returns quickly…I’m sure he’s ok! Naturegirl: Thanks! Yes surprises at the feeder is always a special treat! April: Those nuthatches are so skiddish! I too have a super hard time trying to get its picture. Thanks for the kind comment and good luck getting a picture of your nuthatch! Shelley: THanks!!! They are a little ball of energy! JJ: Thank you! Aren’t we lucky to have such nice nuthatch visits? I love them!!! Troy and Martha: A very Happy Thanksgiving to you too! Thank you so much!